Stamping has been a “nail thing” for absolutely YEARS but seems to have really become more mainstream in 2015. It’s almost been the underdog of nail art and I myself have experienced nail snobbery towards those who stamp and those who hand-paint nail art. For a number of years I chose to hand paint in my role as a professional nail tech, but the fact is that there are some designs that it is nigh-on impossible to produce by hand painting. Also whilst you can produce beautiful designs on your “good” hand, it’s far more difficult and time consuming on your “bad” hand. 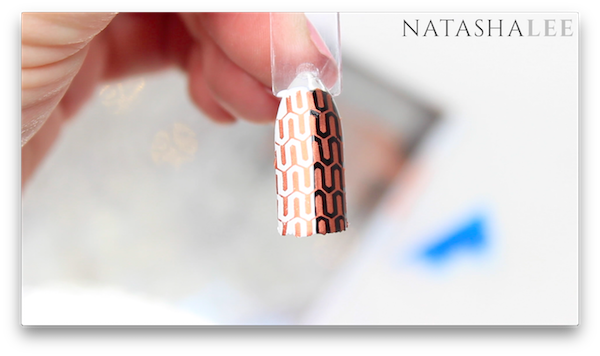 :/ Along with this mainstream and professional discovery of stamping nail art, we as consumers are getting more excited by stamping nail art, and getting more demanding in what we expect from out products!! Every stamping fan is looking for nail stamping polishes/swatches that stamp boldly over both white and black polishes i.e. pale and dark polishes. We all want to recreate the amazing images that we find on Instagram and Pinterest and I for one am always on the look out for those polishes and stamping plates that really are the best! I was sent a sample of the “Hit The Bottle” stamping polishes to trial by Nail Artisan. I’d heard a lot about the polishes and that they had a great coverage over both white and black polishes. I knew that I had to trial them for myself and I thought I’d share my review with you. The first colour I reviewed tickled me based on the name alone!! “Smurf Blood” totally lives up to it’s name 😉 It’s a funky, bold blue with a soft metallic shimmer running through it and it stamps very well over both white and black. “Copper Haired Girl” is a beautiful rich copper-toned metallic stamping polish that stamps absolutely amazingly over white and black, with no loss of the depth of colour. I love the name of this one, “Taupe-lessy Devoted” had me singing “Grease” songs all day! It’s a beautiful warm/soft caramel metallic colour and stamps very well over both white and black. “Spun Gold” is literally THE BEST GOLD stamping polish that I have ever used. It’s an amazing fully opaque, metallic coverage over both white and black polishes. Finally we have “Purple Dragon“, which is a lovely mid-toned purple with a violet shimmer running through it. Again this has a great coverage over both the black and the white polishes. This was my first experience of the Hit The Bottle stamping polishes and I was incredibly impressed after completing the swatches. They were the most consistent that I used where both the light and dark colours stamp strongly over black. Of the 5 colours though, the most striking swatches in their performance were “Spun Gold” and “Copper Haired Girl“. These were completely 100% opaque over both colours with no sign of the colour underneath showing through at all. The other colours performed amazingly, but there was a very, very slight reduction in the opacity over the black polish, but that is me being extremely fussy!